In a recent Facebook post, Dr. Oz cautioned readers to beware of the sodium in your holiday foods because they could raise your blood pressure and “negatively affect your health.” Well, Dr. Oz, it ain’t just Aunt Edna’s Mac n Cheese that’s raising blood pressures at all these family gatherings. Often times it’s Aunt Edna! Or Uncle John or Mother-in-law or Sister-in-law . . . come to think of it most of the time it is “Someone-in-law”. Have you ever heard that verse, “It’s the most, wonderful time of the year” and thought “yeah buddy, you don’t have to spend it with my family!” If you haven’t then yea for you. Probably time for you to leave this blog and go find one about how to turn the simple act of wrapping a present into a 4 hour ordeal which includes weaving your own ribbon. This ain’t that blog. When you Google “Families and Holidays” the first several results are along the lines of tips to reduce family “burdens” and “stress” around the holidays. Doesn’t something about that seem off? Aren’t these supposed to be the people you hold most dear? Then why do they irritate the living fool out of us? I remember reading an interesting article 20-25 years ago either in Seventeen or Cosmopolitan magazine. It was geared more towards romantic relationships but the part that stuck with me was that the reason someone could exasperate you to the point of insanity was simply because they mattered so much to you. You don’t spend as much time annoyed at someone you don’t care about. This person (or these people) are so important to you and you love them so very much that every little annoying thing they do can infuriate you. That explains a lot, but doesn’t exactly warm the heart. I love that line! Because the truth is we don’t often like all the members of our family (or our spouse’s family), but they are important to us. And truthfully, more important than a lot of people we call friends. It’s hard because most of us spend much more of our time at work with co-workers and bosses and people who “need” us than we do our families these days. But if I die tomorrow, while I’m sure several people at work will miss me, within a few weeks they will hire someone else to take my place. My family isn’t going to hire another Mom, Wife, Daughter, Niece or Aunt. So, if you are headed home for Christmas, Google all those helpful hints about dealing with family stress and take deep breaths when Aunt Edna comments that your turkey is extra dry this year, or when Uncle John has a little too much holiday wine and starts snoring in front of the TV, or when your mother-in-law corrects your children’s table manners then makes a comment not completely under her breath about “blame it on their mother”. Put on your rose-colored glasses and maybe invest in a good pair of ear-plugs. Relax and enjoy the family drama – heck maybe even blog about it. There are people throughout our country who are all alone this Christmas and they would give anything to be where you are. There are soldiers in Afghanistan, and places we don’t even know about, who would love to experience the holiday with their irritating, overbearing family. We have the distinct honor and privilege of being with ours. And it’s not all bad, there’s Aunt Edna’s Mac n Cheese after all. I’ll be gone for a few days for Christmas but I’m sure I’ll have plenty to blog about when I return. Merry Christmas to all and to all a Good Night! 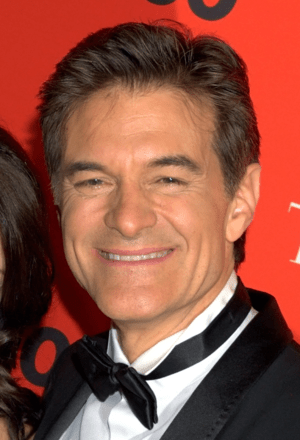 This entry was posted in Life and tagged Christmas, Dr. Oz, Family, Holidays, Humor, stress. FD and I are alone this Christmas, and I think I will enjoy tonight and tomorrow, just the two of us. We’ll sleep in and have a leisurely day tomorrow. I don’t even have a special menu planned. I may not even cook! Happy Holidays Angry… I look forward to a report of your weekend! Our kids live on the other side of the country so we are alone this Christmas. I am looking forward to it. All day to lounge around. No fussing with food. We may go to a diner (if we find one open) for breakfast. Hopefully I’m getting a Kindle from Santa and I’m going to read my little heart out! Merry Christmas! You said it all. Family, despite any shortcomings, are what it’s all about. And I wish you and all your loved ones a safe and happy Christmas. Have a wonderful Christmas – looking forward to hearing about it! I liked this post when you first did it and still love it. What about us girls, Dr. Oz?????? Tell our husbands to give us more back rubs and foot massages and do the dishes and wash the floors. Then maybe we’ll feel more like ah…er….well twice a week. I am over 60 after al. Just thought I would bring you a Christmas surprise for your return… I hope you have had a wonderful one, despite the drama. Just checking in to see if you are okay?